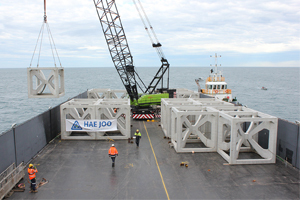 In June 2015, Victoria's largest ever artificial reef was created when 25 concrete modules were deployed to improve offshore recreational fishing opportunities. 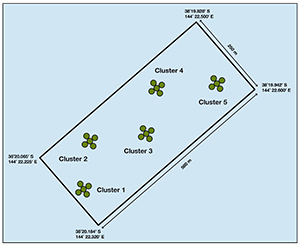 The purpose-built reef modules are situated approximately 3 kilometres offshore, in 25 metres of water, between Breamlea and Torquay. 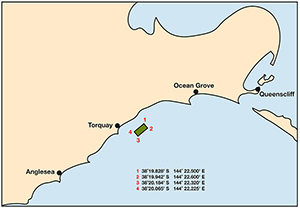 Each concrete module measures more than four metres high, weighs up to 20 tonnes and has been designed to create variable water currents and upwellings that will attract baitfish and predators such as kingfish. The reef will be colonised rapidly by aquatic plants and animals and recreational fish species are expected to follow. The project was funded by $1,090,000 from recreational fishing licence fees and $410,000 from State Government Initiative funds in one of the biggest fish habitat enhancement projects in Victoria's history. The Victorian Fisheries Authority will undertake frequent underwater monitoring of the reef over coming years to evaluate its effectiveness and identify the fish it attracts. The reef complements others in Victoria including three for snapper anglers on the eastern side of Port Phillip Bay, near-shore reefs for land-based fishers at Frankston, Altona and Portarlington, and shallow-water reefs in several East Gippsland estuaries.